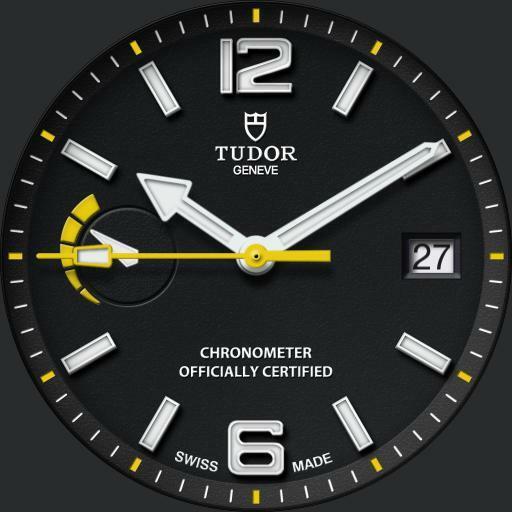 Tap logo to cycle faces standard and Chronograph. Tap Center for UColor selector. Tap between 4 and 5 area to zoom. Tap between 7 and 8 area for dim mode menu. Tap text to cycle modes Normal, Always On and Off and tap X to close. On Chronograph face large seconds hand is Chrono seconds. Tap seconds dial to start/stop Chrono and tap Minutes dial to reset. Seconds hand shows phone battery level on dim for both faces. On Chrongraph face large seconds hand is watch battery on dim.